Just wow. Wow wow wow. When I got my iPad Pro with the Smart Keyboard, I was very disappointed when I opened OneNote and saw the sheer lack of keyboard shortcuts when it came to formatting. And what little keyboard shortcuts they did provide made little to no sense (command option 8 for bullet points? really?). Then came Bear. Though it has PAGES of keyboard shortcuts, you don’t need them! Want Header 1? Just type #. Want header 2? ## Bullet points? Just stick an *. Need to underline? Just put _ before and after the text. This is INGENIOUS and has completely changed the way I take notes in class. Thank you, Bear! It’s got some sort of magical effect. 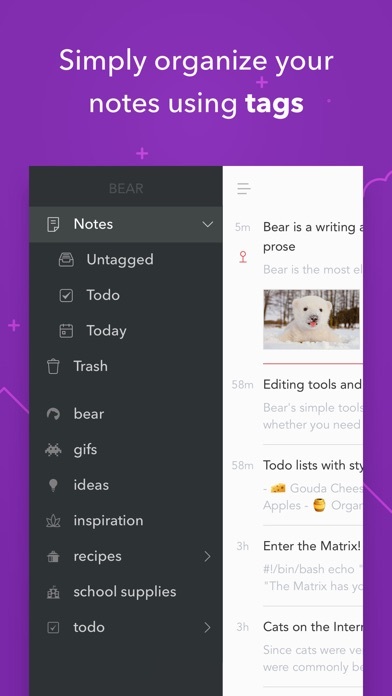 I feel like writing everything in Bear now. 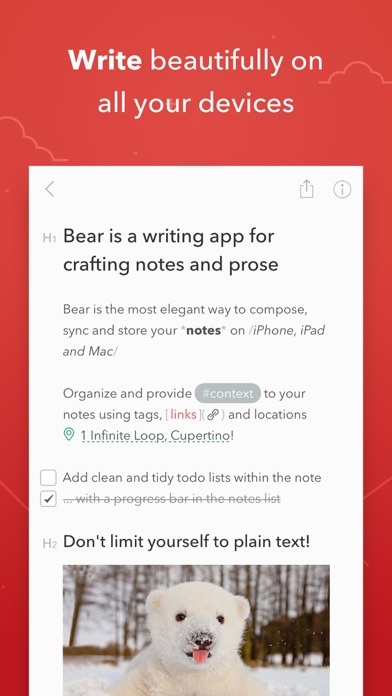 It’s not like this is the only markdown app or the only way to write and share notes. I used EverNote, SimpleNote etc for years. The experience ranged from Meh to Uuuugh (looking at you, EverNote!). Here, I feel like writing everything and anything in this app. Creative writing, PowerPoint voice tracks, emails, grocery lists, Strongly-Worded Letters, anything. 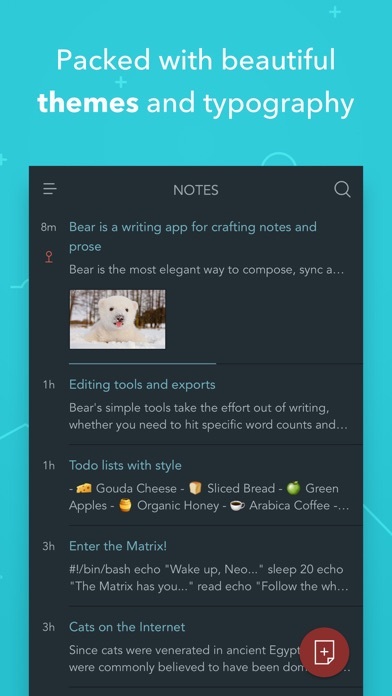 I’ve used the default Notes app on iOS and Google Docs on my iPad, and honestly Bear is the only writing app I just really love. Even the free version does so much and can make everything flow so naturally and beautifully. Now if only I could buy the pro version outright instead of having to subscribe! The free version is a wonderful text editor with features to add lists, check boxes and more. Im not fully sure what paying for the app does besides unlock themes and cloud saving. 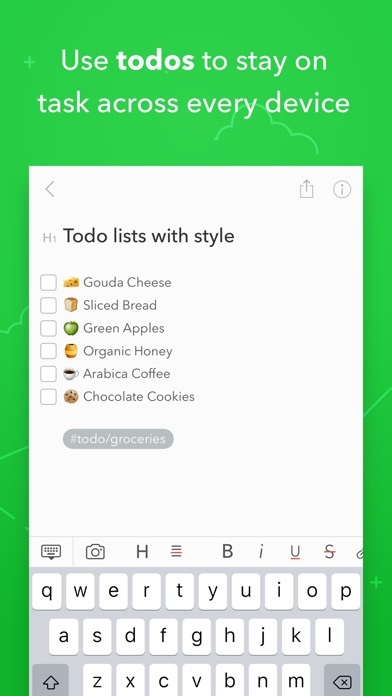 I basically use this app for grocery lists, check lists, and just general notes. We love it. We tried many different note apps, and this so far is the most bang for your buck. 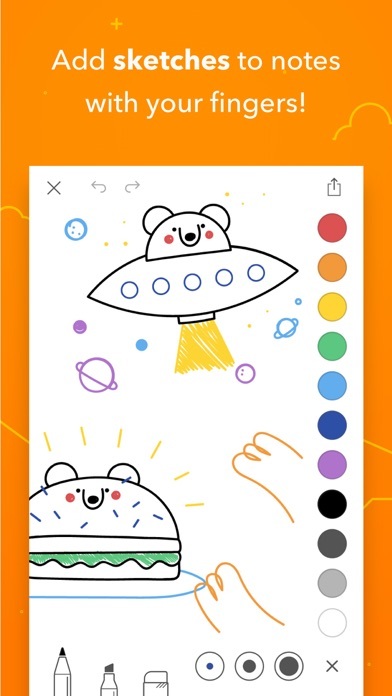 hey what an amazing app !!! More by Shiny Frog Ltd.